Most VSPackages provide interaction opportunity to access the built-in functionality. The easiest way to access a particular function is to create a Visual Studio command that provides a link between the IDE’s menu or toolbar and the corresponding method of the package. In this post, you will create a very simple package that adds a command to the Tools menu. When you click the menu item that represents the command, a message box confirms that the command has been invoked. Start a new Visual Studio project. In the New Project dialog, select the Extensibility template category under Visual C# | Windows, and then choose the VSIX Project template. 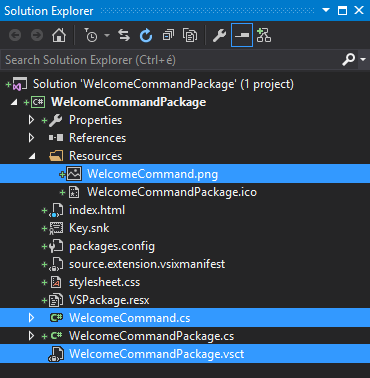 After the IDE has created the project, in Solution Explorer, right-click the WelcomeCommandPackage project node, and add a Visual Studio Package item (WelcomeCommandPackage.cs) with the Add New Item command. Use the Add New Item command—just as you did when you added a new VSPackage to the project—, and create a new Custom Command item, as Figure 1 shows. Name the new item WelcomeCommand.cs. That’s all. The custom command you added to the package is integrated with the project, so you can try the VSPackage without any further code. Run the project with Ctrl+F5. When the Experimental Instance starts, you can find a new menu item in the Tools menu, as Figure 2 shows. When you click this menu item, the package pops up a message dialog (Figure 3). At first sight, it seems that implementing a custom command should be a very simple task: we somehow have to add a menu item to Visual Studio and create an event handler to invoke the appropriate method when this very menu item is clicked. As you already learned, the shell loads the packages into the memory on-demand. In the case of the custom command we added in WelcomeCommandPackage, this moment is when the user clicks the menu item. But wait! How can the menu item be displayed if the package is not loaded yet? Visual Studio custom commands can be set up so that they are available from other packages, or can be invoked from the Command window. Depending on the function of the command, it may be enabled in a certain context and disabled in another. For example, if the command requires an open solution, it should not be invokable while there is no solution loaded. Commands are entirely separate concepts from the UI elements that represent them. The menu items, toolbar buttons just trigger the execution of a command. When a command cannot be executed in a particular context, the dimmed state of corresponding UI elements reflect the state of the command. Now, let’s see what happened when you added a new custom command to the project! The wizard behind the Add New Item function created three new project files—WelcomeCommand.png, WelcomeCommand.cs, and WelcomeCommandPackage.vsct—, as Figure 4 shows. The package now has a ProvideMenuResource attribute decoration, and in the Initialize method, it invokes WelcomeCommand.Initialize. Each package can register menu resources that define menu and toolbar items that are integrated with the shell so that the user can trigger a particular command. A VSIX project defines this information in an XML file with the .vsct extension, and the build process compiles the .vsct file into a menu resource named “Menus.ctmenu”. The ProvideMenuResource attribute has two arguments. As you can see from the code listing above, the first argument is the name of the menu resource, namely “Menus.ctmenu”. The second argument is a version number. At the moment you added the new custom command, the Add New Item wizard set up the VSIX project so that the WelcomeCommandPackage.vsct file compiles to the “Menus.ctmenu” resource. Both the name of the .vsct file and the resource are wired in the project file (WelcomeCommandPackage.csproj), so either renaming WelcomeCommandPackage.vsct or changing the resource name in ProvideMenuResource would prevent the menu item from appearing in the Tools menu. NOTE: Please observe, I removed the generated commands and changed the syntax to C# 6.0 for the sake of conciseness. Also, I renamed a few class members to adopt to the naming conventions I use. As a useful convention, we use the same GUID for commands that logically belong together, and set separate command ID within that particular GUID. Each command needs to be hosted by a container that can manage the command, namely tell whether a particular command can be executed and invoke it when the container is requested to do so. For custom commands, this container is an OleMenuCommandService instance that can be requested from the package through the ServiceProvider.GetService() call. The ServiceProvider property retrieves the package itself. The last part of the constructor assigns the command to the MenuItemCallback function that is executed when the command is triggered and adds this command to the OleMenuCommandService instance. NOTE: The VsShellUtilities class contains about 50 static members that help you with shell-related common tasks such as showing dialogs, checking the state of the IDE, managing documents, and much more. I still need to explain how Visual Studio displays the menu item related to the command, and how it knows that clicking that item should trigger WelcomeCommand. The missing link is the WelcomeCommandPackage.vsct file. NOTE: When the wizard generates the .vsct (Visual Studio Command Table) file, it creates it with detailed comments that help you understand the role of a particular markup part. I deliberately removed those comments for the sake of brevity. I suggest you keep them. The <Extern> nodes refer to C header files that contain Visual Studio shell command-related identifiers. The <Commands> section declares the structure of the triggerable items (menu and toolbar items) and the commands they trigger within the package. The <Symbols> element collects mappings between symbolic names and identifier values. The package attribute of <Commands> links the nested commands to WelcomeCommandPackage—it names the GUID that identifies the package. As you will see later, the value of the guidWelcomeCommandPackage symbolic name is defined within the <Symbols> section. Commands can be placed into the menu structure of the Visual Studio shell through command groups. The single <Group> element within <Groups> declares a logical container (identified with a guid and an id). The <Parent> element tells that this logical command group should be put into the main menu of the IDE (guid=”guidSHLMainMenu”), within the Tools menu (id=”IDM_VS_MENU_TOOLS”). NOTE: The aforementioned identifiers are declared in the vsshlids.h file that is imported with the <Extern href=”vsshlids.h”/> node. The <Buttons> section declares triggerable menu items with their visual appearance. The single command in our package goes into a menu item declared with the nested <Button> element. The <Parent> node refers to the logical container the menu item belongs to. As you see from the markup above, it is the single <Group> we placed into the Tool menu. Menu items may have icons. Here, the <Icon> of the command is a sprite (id=”bmpPic1″) within a bitmap stripe (guid=”guidImages”). The <Bitmaps> section declares the available bitmap resources with their sprites. As Figure 5 shows, the WelcomeCommandPackage.png bitmap stripe contains six sprites, each of them identified with the bmpPic1, bmpPic2, bmpPicSearch, bmpPicX, bmpPicArrows, and bmpPicStrikethrough indexes, respectively. Wherever you use a symbol name in the .vsct file, that is replaced with the corresponding value. Now, you have learned the fundamental aspects of managing custom commands in Visual Studio. Let’s summarize how they work! You define the structure of the menus and their corresponding commands in the .vsct file. 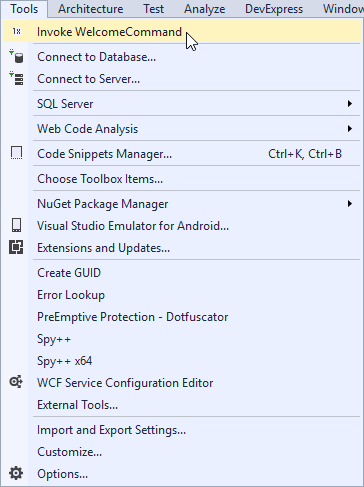 When the VSIX utility deploys the VSPackage, the menu resources declared in the package are merged with the Visual Studio menu. Even if you package is not loaded yet when the IDE starts, the items are displayed in the menus. When the user activates a menu item, the shell checks whether the package that hosts the related command is loaded. Do not forget, commands contain the IDs of their declaring packages, and thus the IDE knows which package to check. If the package is not loaded yet, the shell loads it. With the help of its OleMenuCommandService instance, the package dispatches the command to the object can execute it. 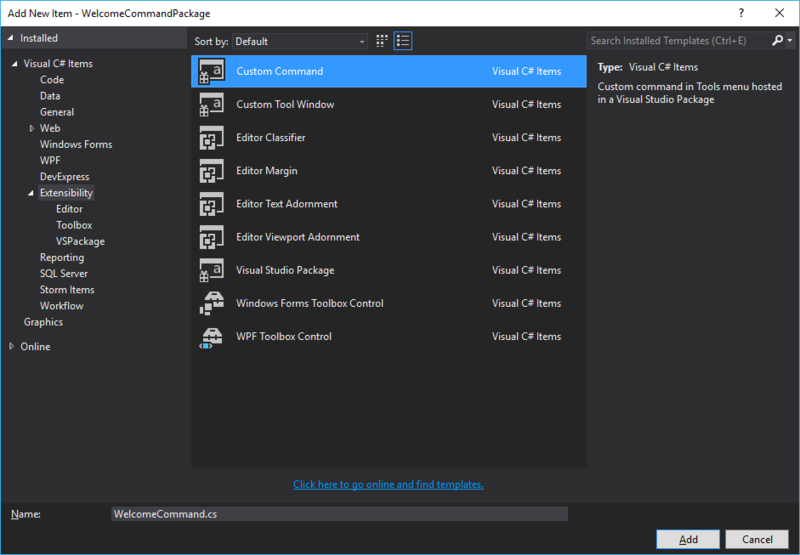 You have just scratched the surface of what you can do with Visual Studio commands. In the next post, you will learn about tool windows.